The world of lighting design is very broad and diverse and it is often difficult to know which devices to get and in which quantities. This is where our light sets come in. 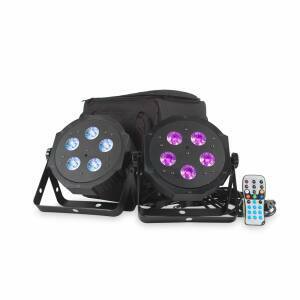 Available for example as LED spotlights, moving heads or LED bars, your next party is sure to be a huge success. Lighting effects are a true eye-catcher which will hold you audience?s gaze captive. 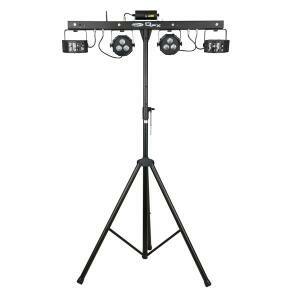 Today LED spotlights are a part of every event?s basic equipment. They are made of many differently coloured LEDS. Inbuilt COB chips make it possible to install more of these LEDs into a smaller device and still gain higher colour intensity. Well liked are also our moving heads. Their nearly limitless ability to move gives you the possibility to integrate them into any kind of event location. 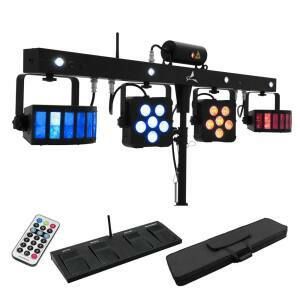 They are available as Spot, Beam or Washlight and allow you to use gobos. And finally LED bars are a good way to bring emphasise a location?s main features. They enable you to create different kinds of colour and fader effects. Their small size and low weight makes their assembling and disassembling very easy.